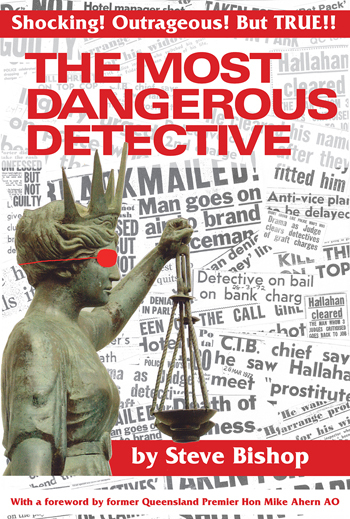 G'day and welcome to the website of journalist Steve Bishop, author of The Most Dangerous Detective. Be shocked and outraged by this true account of murders, sexual intrigue, Machiavellian politics and corruption aided by three judges, two premiers, a leading lawyer and an editor. The first edition topped the best sellers in its category on amazon.com where it went on to out-rate similar books with reviews averaging 4.5 stars out of five. The second edition adds revelations of how the tentacles of corruption reached towards the federal cabinet process. It retains revelations from the first edition which are no longer available to researchers, having been locked away in State Archives for up to 100 years. I've asked corrupt former police commissioner Terry Lewis key questions about how he perverted a royal commission, his role in the illegal drugs trade and where the power lay between him and Premier Bjelke-Petersen (The Lewis 'not guilty' charade). After 25 years researching I had to slash thousands of words from my manuscript to prevent it from being a hernia risk. I'll add some of these stories to this site from time to time. Do you know the identity of the real town like Alice and what has happened to it since Nevil Shute touched down in his tiny wooden plane 70 years ago? Find out in Discovering The Real Town Like Alice. I'll try to answer your questions but there will be times when I'm unable to answer for several days so I apologise in advance and please bear with me. Finally, having created a website I'm not going to let the chance of airing a few opinions go begging. I'll be commenting on issues that amuse, appall, interest or intrigue me.